In the fortnight between the French and British Grand Prix the Formula 1 stars were racing in various places as usual. Pedro Rodriguez was driving Herbert Muller's Ferrari 512M sportscar in an Interserie race at the Norisring. The popular Mexican driver crashed heavily and was trapped in the burning car. He was rescued but died of multiple injuries a few hours later in hospital in Nuremburg. BRM did not replace him and ran only two cars for Jo Siffert and Howden Ganley. Team Lotus continued its adventures with the Pratt & Whitney-engined Lotus 56, driven on this occasion by Reine Wisell, while South African customer Dave Charlton was given one of the Lotus 72s. McLaren decided to run a third car for Jack Oliver, while Surtees ran Derek Bell alongside John Surtees and Rolf Stommelen. The other addition to the field was F1 new boy Mike Beuttler in a private March which was entered by the Clarke-Mordaunt team. There were no major surprises in qualifying with Clay Regazzoni on pole position from Jackie Stewart (who was in a commanding lead in the World Championship) with Jo Siffert's BRM on the outside of the front row. Emerson Fittipaldi shared the second row in his Lotus with Ronnie Peterson's March (now with Cosworth engine after a one-off race with Alfa Romeo power at the French GP) while Jacky Ickx was back on the third row in his Ferrari, alongside an impressive Tim Schenken (Brabham) and Denny Hulme's McLaren. At the start Regazzoni and Ickx took the lead for Ferrari with Stewart third. At the tail of the field Oliver ran into the back of Graham Hill's Brabham, putting both men out of the race. 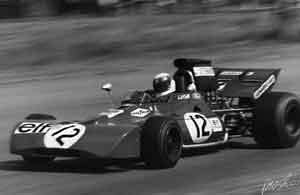 Stewart and Siffert overtook Ickx during the second lap and on lap four Stewart overtook Regazzoni at Stowe Corner. The Scottish star immediately began to build up a lead. Siffert overtook Regazzoni in the course of the fifth lap and then things began to settle down with Stewart ahead of Siffert, Regazzoni and Ickx. The major interest in the race was supplied by Fittipaldi, who had made a bad start and was driving through the field from 11th place at the end of the first lap. Siffert began to suffer vibration problems and was caught and repassed by Regazzoni on lap 17. On lap 37 Ickx went into the pits to retire with engine trouble and five laps later Siffert also disappeared with a bad misfire. This put Peterson up to third place with Schenken and Fittipaldi chasing him. On lap 48 Regazzoni disappeared with engine trouble. Stewart kept going and it looked as though Peterson and Schenken were going to be the other men on the podium but with a few laps to go Schenken suffered transmission failure and retired, leaving third place for Fittipaldi. Everyone else was lapped.